The Sacrament of Confirmation is celebrated at Saint Patrick Catholic Church annually. Sacramental Preparation for Confirmation is open to all incoming 9th through 12th grade students who are baptized into the Catholic Church, have received First Eucharist. When you were baptized, you and your family began a journey of faith in God. Your relationship with God was marked as collaborative. You began to learn how God shows His great love for you, and how you can respond in return. As the scripture above indicates, God wants complete joy for you, and He can show you the way to it if you continue to follow Him. 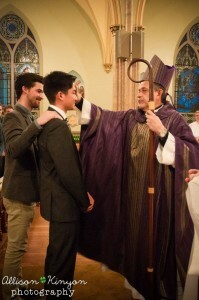 Our parish takes seriously the task of preparing candidates to receive the Sacraments. To get the most out of the program, we have certain requirements and encouraging suggestions. Attend Mass every Sunday and Holy Days of Obligation. 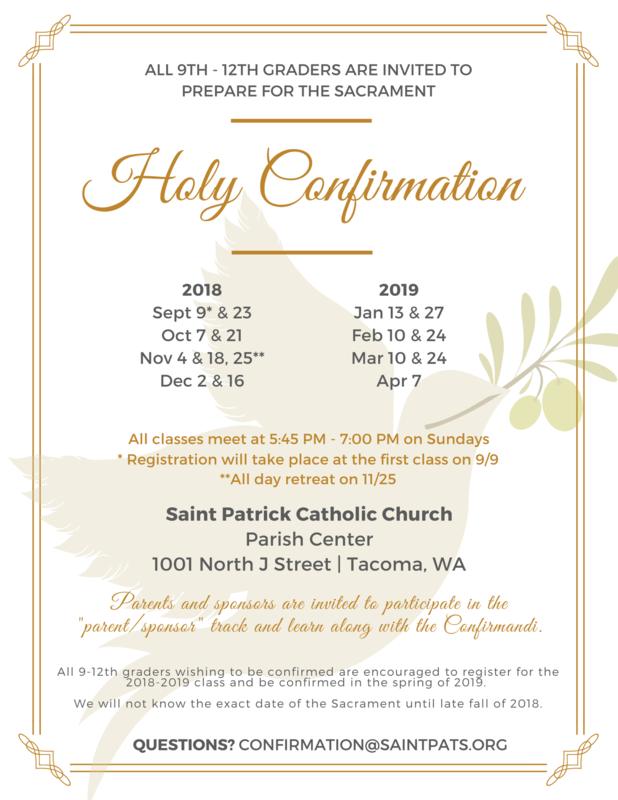 Preparation for the sacrament of Confirmation for young people at Saint Patrick Catholic Church uses the program Chosen— Your Journey Toward Confirmation. Chosen: Your Journey Toward Confirmation is a 24-lesson program that provides the students everything— both intellectually and spiritually to receive the Sacrament of Confirmation. The program will both catechize and challenge teens to fully embrace a life in Christ. Chosen is a comprehensive learning experience centered around fully integrated video and workbook lessons. Guides for leaders, parents, and sponsors seamlessly incorporate into the program to make Chosen unlike anything available in the Church today. What is the mission of the Church? What is your role in carrying it out? To what are you commissioned? How do the lives of the saints inspire you to “give off the aroma of Christ”?